We’re not done with the kitchen reno yet (that we started last January, gulp), but I feel like I’ve learned enough in the past ten months to share some of my hard-earned wisdom. I know that ours isn’t your typical kitchen reno, we didn’t rip down any walls, take out cabinets or replace appliances, although we did build a cabinet, and we didn’t hire anyone to do any of the work. 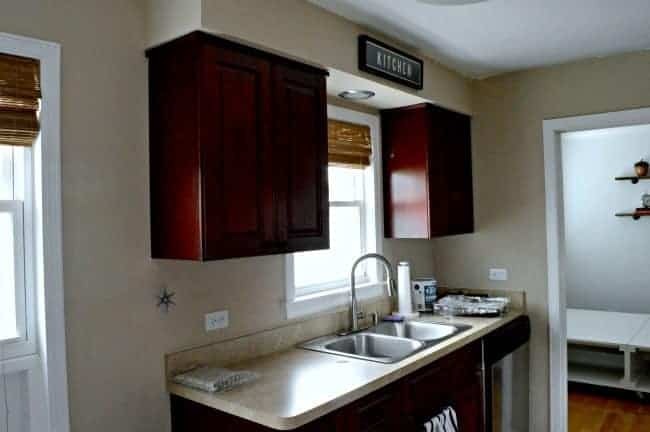 Our reno has been done by just the two of us…from design to electrical to plumbing (we have removed and reinstalled the sink 4 times, and counting), to planking the ceiling and installing granite countertops. Not that there’s anything wrong with hiring out. 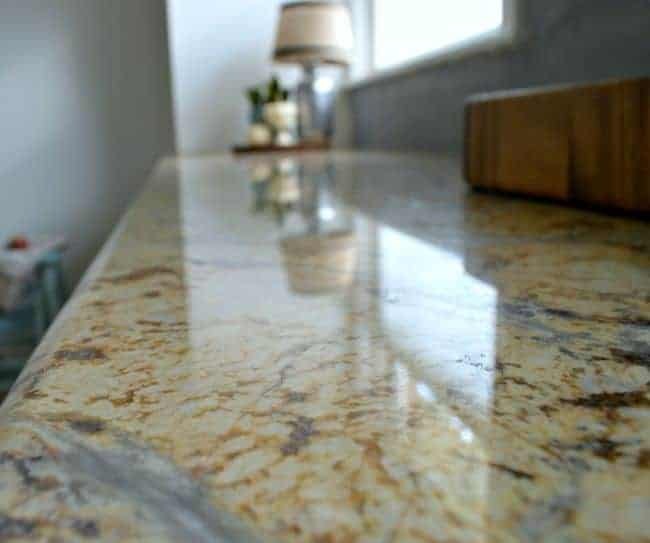 A lot Some days I wish we would’ve done that, but we were on a very tight budget and we were confident that we could handle the projects that we needed to do on our own, although we did sweat it out when it came time to do the granite countertops. It’s really been a long, tough road but it’s been a great experience and I’ve learned a thing or two about myself. 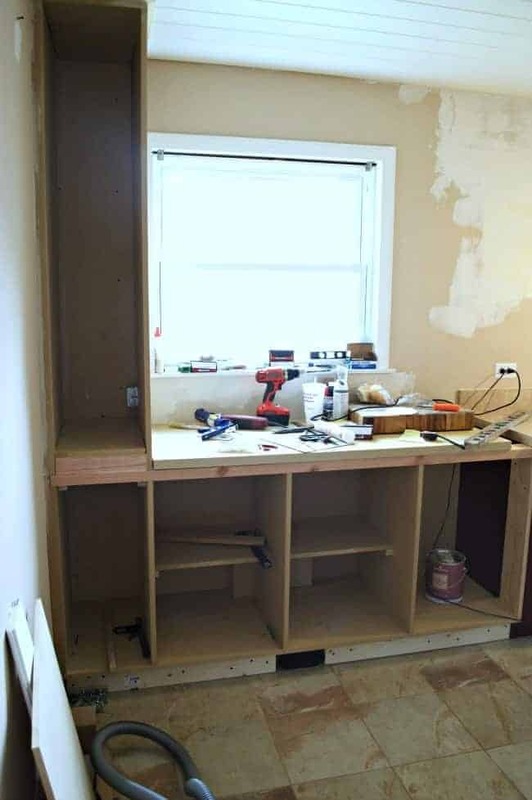 I know, learning stuff about yourself from a kitchen reno…crazy! Anyway, here’s a few things that have helped me survive through all of the chaos. Try to make some part of your living space a reno free zone. 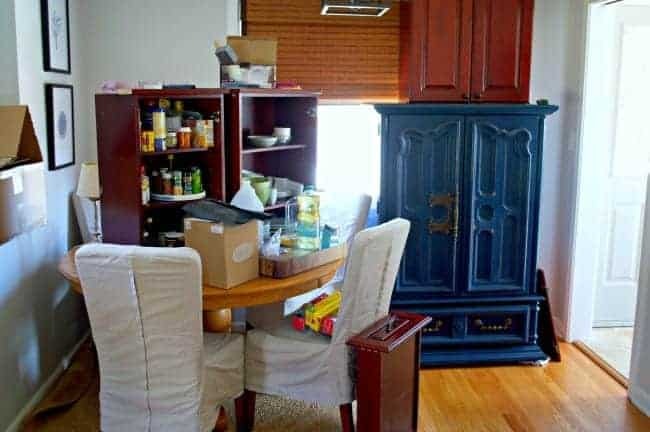 We have a small house and all the stuff that we had in the kitchen has been tucked into different corners in almost every room, with lot of tools and paint adding to the mess. It’s been hard at times, but I try to keep the living room looking as normal and tidy as possible so we can relax at night without looking at reno stuff. Go ahead and decorate, a little, for a holiday. When you’re in the middle of a reno and there’s stuff everywhere, the last thing you want to do is haul boxes out of the basement and take more stuff out. I know, I get it, but it’s nice to have a small area fixed up and looking pretty (like my living room) for a special holiday/season. It adds some life back into your space. I didn’t feel like doing it, but I was so glad I did after it was decorated. Don’t go crazy cleaning all the time. Ok, this has been a really tough one for me. I’m going to tell you something that I’ve never told you before…I’m a little OCD when it comes to cleaning. When we were first married, I would happily clean the same things every. single. day. I’ve really calmed down over the last 30 years, if you ask my husband he would say I’m still obsessed, but having a dirty house still stresses me out. Well, when you’re knocking down soffits and building cabinets in the house, everything tends to get really dusty and dirty. I’ve tried to keep up but it’s been frustrating and nearly impossible, so I’ve had to let it go. Don’t get me wrong, I can’t stand the mess but it makes me angry when I clean something and 15 minutes later it looks like I never touched it. I’ve gotten by doing the bare minimum and, when I can’t stand to look at the dust anymore, I take a walk outside . Take some time to get out of the house, away from the mess, and have some fun. I work from home so I am around all of this 24/7. Living in a disaster zone all the time can really get to me so I go outside as much as I can, even if it’s just to walk Finn (you’d think I would’ve lost a couple of pounds with all of this walking around outside for 10 months 😉 ). I try to go out and putz around in the garden for a while or I’ll take a drive to HomeGoods to walk around and browse. Anything to get my mind off of the house and the reno. Most of the time it works and I can go back in and get my work done, but not always. We also try to spend some time together going to breakfast and hitting up a few estate sales every Saturday before we get down to working on the kitchen. It’s something we both enjoy and it gives us something to look forward to, instead of worrying about what we’re going to work on in the kitchen. Remember that this isn’t going to last forever. I have to tell myself this every day. When you’re in the thick of things, it’s so hard to look past it all, but you need to remember that it’s only a moment in time and it won’t last forever. I just keep reminding myself that we’ll have a beautiful kitchen we can all cook in when we’re done. When we’re done…when we’re done. Ten months is a long time for a kitchen reno but we’re finally able to see the light at the end of the tunnel. Last weekend we finished tiling the backsplash on the big window wall and the stove wall is on the list for this weekend. One project at a time, that’s all we can do. 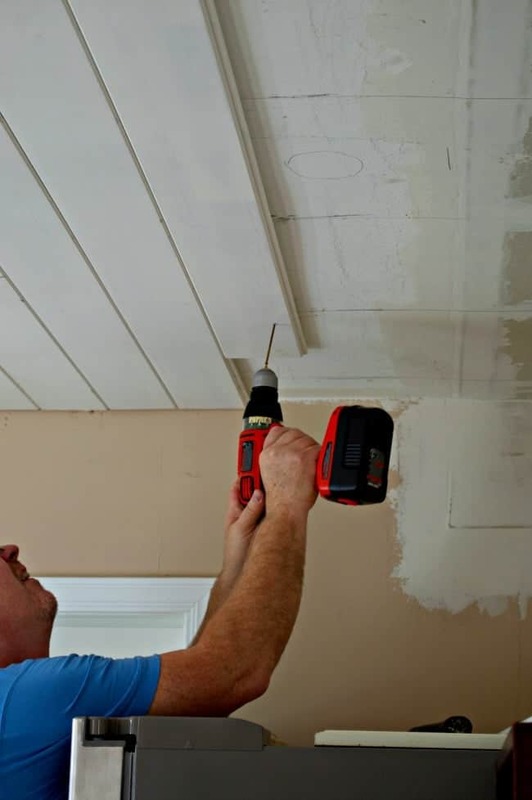 Have you lived through any kind of big renovation before? How did you survive? I had it done last year- by a contractor, arm just out from sling after shoulder prosthesis implant 🙂 . Have just the small apartment. 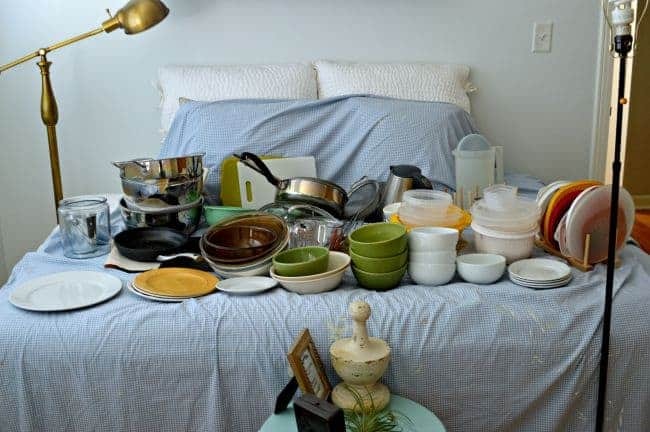 So rearranged a small “living” area – meaning I could just use one chair and my sofa at night, put slowcooker into bedroom, microwave in living , had “emergency kitchen” for food prep on my dining table, usedd about 2 plates and m/w bowls to eat from. Fortunately fridge/freezer were running all the time. Washing up in bathroom, sighs. When in the last weekend all appliances were brought in, had no place anywhere to sit down- asked myself to eat out with a friend ! 🙂 but am settled now. Wow Elly, sounds like you lived through a rough reno. So glad that it’s all done and you are settled in. Thanks so much for sharing your experience. Won’t be long now – stay strong – gonna be so awesome to see your big reveal. Keep your eyes on that light at the end of your long tunnel you’ve been walkin! I’m so glad that you came to visit, thanks! 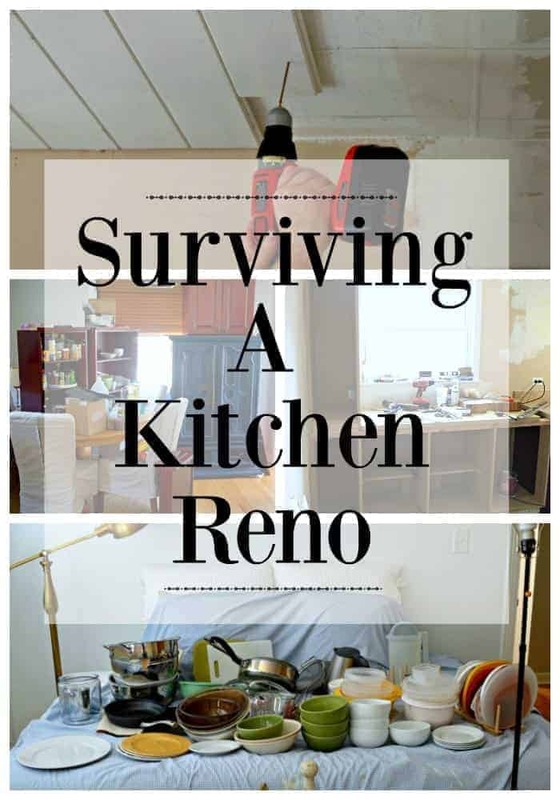 Thanks for the great tips about surviving a kitchen reno. We’re just now getting bids for contractors to redo our kitchen, and hearing numbers like 5-6 weeks seems like a nightmare. I can’t imagine 10 months! So glad that you liked my tips. I think that 5-6 weeks sound great, but I know that any amount of time with a ripped up kitchen is tough. 😉 Good luck on your reno and thanks so much for stopping by. My heart goes out to you! It’s such a mess right now but will be worth it in the end! We are finished and loving our new space! Hop over and share at Amaze Me Monday! I know that we will enjoy it once it’s done. I’ve seen your beautiful kitchen and I’m sure you’re enjoying every inch, love the window and the island and the fireplace. 😉 You did so much more than we are doing, so I know that you understand. Thanks for stopping in and offering words of encouragement. I appreciate the invite to your party, I’ll definitely stop by. Kristi, you will finish your big project if you just keep with it. We were getting ready to redo our kitchen last Fall. The cabinets were all emptied all over the house as you say. I emptied all of mine, then learned in Oct. that I had cancer and needed a radical hysterectomy and removal of some lymph nodes. I was in no condition to continue with the remodeling or to put everything back in the cabinets. In March I had recurrence, requiring 8 weeks of external and internal radiation. I’m through that now and finally hope to get started with refinishing cabinets, installing countertops and backsplash. Wish me luck that we’ll finally get through that so everything can FINALLY go back into the cabinets.Oh, happy days. I’m a neat freak, so can’t wait to get everything back so I don’t step in a skillet everytime I go into another room! Oh my June, I’m so sorry to hear about your health issues. Complaining about my too long kitchen reno seems very frivolous when you think about it. I hope that you remain well and that you are able to get through your kitchen reno, stepping in a skillet every time you go into another room is no fun, and hard on the feet. 😉 Take care and best wishes to you. Haha, thanks for that comment Deb. It made me laugh out loud, and I so needed that today. 😉 Just keeping it real my friend. All very good tips, Kristi. I’ve been through a number of renovations. The worst was a kitchen renovation with my late husband where we tore out everything down to the studs and rebuilt it. That’s okay, but what made it “the worst” was that our kitchen cabinets didn’t get ordered by the designer and so we had to wait an additional 5 weeks to get them installed. Which means we were eating pizza or using the microwave to cook and washing dishes in the garage for about four months. Ugh! Oh Nancy, that sounds awful. Things just never seems to go as planned, especially with a kitchen reno. We thought we’d be done before August but, at this point, I’d be happy to be done by Christmas. Seeing the light at the end of the tunnel? Great feeling. I can’t wait to see the completion and all of your decorative touches! Thanks Brenda! We’ve gotten to the point where I finally feel like shopping for decor. I hadn’t given it much thought this whole time, too many tasks to worry about. 😉 Can’t wait to put it all together. You are not alone Jennifer. 🙂 Wow, major kudos to you. Two renos…I’m not sure I could do that. My whole life is a reno . . . wait did say that? I just keep finding things to redo and new adventures, I mean ideas. I lived with the dust when tearing out walls and insulating and putting back the sheet rock. The plastering was the messiest and it was all over the house. Yuck! And you see it weeks after you are done! Like you said, it will be done and you will smile each time you walk into your new kitchen. That’s worth waiting for! Been there, done that! 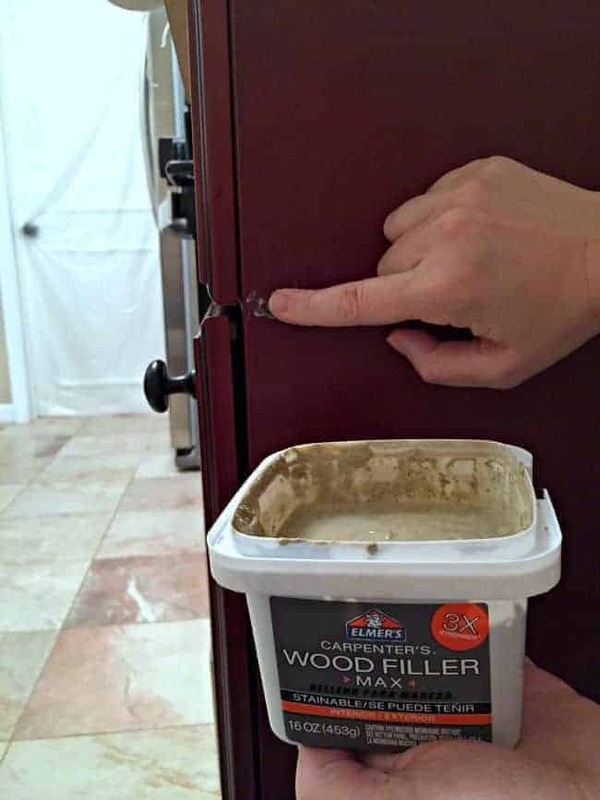 My husband was a weekend DIY warrior, too…and it was not fun. I know that had we paid for the reno it would’ve been completed in a 1/4 of the time. Ah well, he loves to do it and it does save a ton of money so that was never an option. Your place looks fabulous and it’s almost done!! Yay! You are almost there. Keep your eye on the prize. 🙂 I have two baths and a kitchen to strip wall paper from and paint next year and I am dreading it. It will probably take me a year to finish, maybe longer YUK Have a good weekend.